Would You Like to Stay in?" Wondering where to stay? We will go over the Lake Garda accommodations, including Lake Garda hotels, holiday villas, residences and apartments, agriturismos and camping. If you have not been to Lake Garda before, then you will also need to decide whether to stay in the North or the South part of the lake, as they each offer different types of experiences and activities. We'll give you some general advice on this and also on booking your accommodation. We can offer a range of accomodations all round the lake which you can look at and book online. So...Ready for the Lake Garda Accommodations to be revealed? We have partnered with Hotels.com (or Venere who were taken over by Hotels.com) for around 10 years now, to ensure you get a good selection of great accommodations from all around Lake Garda. Hotels.com have been around for a long time and are now a very large global leader in online hotels. They offer hundreds of thousands of hotels worldwide! More importantly they offer well over 1000 great Lake Garda accommodations, so you have plenty of choice!! View all the available Lake Garda accommodations in one place. This allows you to simply enter your desired dates and then filter the results by price, star rating or guest rating. 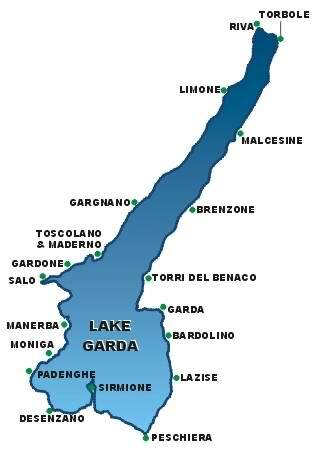 This makes it very easy to choose from a wide range of great hotels at Lake Garda! Take a look at all the special deals currently available at Lake Garda! Check out all the last minute hotels deals for Lake Garda! Now we'll go over the different types of the Lake Garda Accommodations. You can also get more information on each section and find out what to expect for each type of accommodation. One nice thing about the hotels here is that you seldom come across the huge impersonal chain complexes. Most Lake Garda hotels are unique one-off authentic Italian hotels that are often run by local families. And they're usually small to meduim in size resulting in huge attention to detail...from the architecture and style to the way they fold your towels! They have a very relaxing atmosphere and tend to cater to people on holiday rather than on business, thus giving a much more personal feel. Many hotels also enjoy excellent lake side locations which are perfect for watching the evening sun bouncing off the lake. Hotels are the most popular type of the Lake Garda accommodations. The Lake Garda holiday villas are each extremely unique and vary greatly in size and style. They are often owned and run by a local family. Independent villas are great if you want lots of your own space and privacy...they often have a pool and lovely garden to enjoy. These types are generally self-catering, although some do include breakfast. In most cases they are just outside of the towns, so you'll probably need a car...but the plus side is that it's very quiet! No noisy scooters and people keeping you up at night (the Italians come alive at night!!). Villa hotels are usually very high end hotels that used to a be old villas. 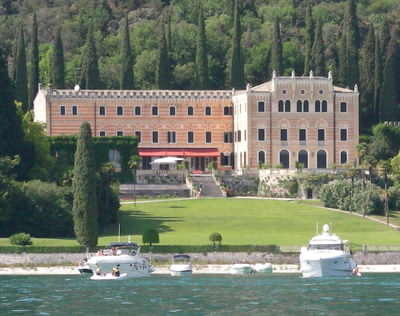 Thus they are too big for an independent or very exclusive villa for those wishing to pay loads of money for the ultimate of the Lake Garda accommodations. A Lake Garda holiday residence is basically a large house or a complex of terraced houses that have holiday apartments within. It kind of falls in between a hotel and a villa - larger than a hotel room, and smaller than a villa. What do I mean? Well, I'll put it this way: A residence is like a hotel in that there are facilities (such as swimming pool, tennis courts, etc. ), that are shared with the other holiday-makers in the complex. Each apartment is like a small 'villa' (each has a kitchenette, etc. ), and generally self-catering. They accommodate from 2/3 up to 5/6 people each, sometimes more. Because of this, Lake Garda holidays in a residence are great for families with children. Residences and apartments often are some of the best value of the Lake Garda accommodations. "Agriturismo" literally means Farm Holiday. They are almost always a Bed and Breakfast type of accommodation, however can be self-catering as well. They are, obviously, on a farm in the country, often set in vineyards. Often there will be home produced wine, olive oil and honey. So if you're into everything natural and love the country, then this would be ideal for you. While some can be located a little further away from the lake, their prices are often much less than a hotel. They can vary in size and facilities but are often wonderful old Italian buildings with masses of character and charm. Agriturismos are usually one of the most relaxed and good value Lake Garda accommodations. 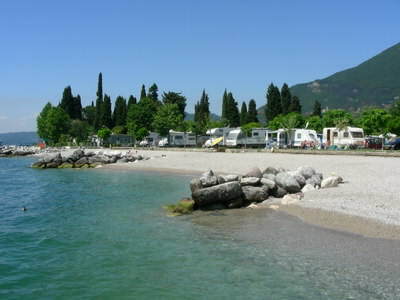 Lake Garda is packed full of great places to go camping, the lovely climate, wonderful surroundings and huge selection of camping facilites make sure of that! Camping sites can be found around most parts of the lake, although the majority are located on the southern half of the lake. There are many sizes and types of camp sites, some located close to the lake while others are further away in the countryside or perched up in the hills overlooking the lake. Many have swimming pools and a range of sporting and leisure activities. You will also often find on-site shops, laundry facilities, restaurants, bars and good washing/toilet facilities. Why not take a look at all the special offers now available?